A-PDF Form Data Extractor is a simple utility program that lets you batch export PDF form data to CSV or XML file format. 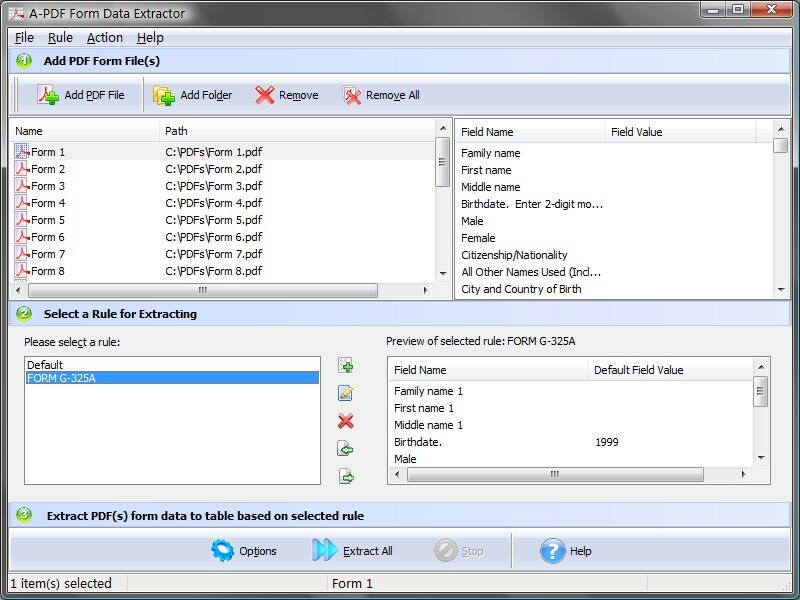 A-PDF Form Data Extractor provide a visual form fields extraction rule editor to verify and define what form fields to be gathered conveniently and automatically. A-PDF Form Data Extractor does NOT require Adobe Acrobat, and produces documents compatible with Adobe Acrobat Reader Version 5 and above. * Import and export extraction rule. Qweas is providing links to A-PDF Form Data Extractor 2.3 as a courtesy, and makes no representations regarding A-PDF Form Data Extractor or any other applications or any information related thereto. Any questions, complaints or claims regarding this application A-PDF Form Data Extractor 2.3 must be directed to the appropriate software vendor. You may click the publisher link of A-PDF Form Data Extractor on the top of this page to get more details about the vendor.